Spandan is the spurt of a dream that was planted in the soul of a woman that abhorred inequality and injustice and was impulsive to take sides of marginalized. This charted the course and shaped the Mission " to empower the marginalized in a manner that they are able to secure their Human & Constitutional Rights and lead a life of dignity." 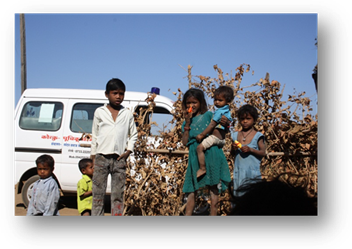 Spandan a grassroots organization began its journey of development with nutritionally vulnerable Korku tribe of Madhya Pradesh being troubled by scores of their children dying of malnutrition. The initial effort to draw government attention to this crude reality wasn’t easy neither savored. The years of observations, studies and community learning revealed that ghastly household hunger gnawed at the doorsteps of most of the poor ready to devour more children. The Hunger scenario has loomed larger and has assumed chronic character. The rapid acculturation of a hunter-gatherer tribe that settled at the end of nineteenth century has found it difficult to find the nutrition they had from their earlier habitat. The tribal millets too being forgotten the community nutrition is becoming worse and manifesting with more childhood malnutrition and deaths. 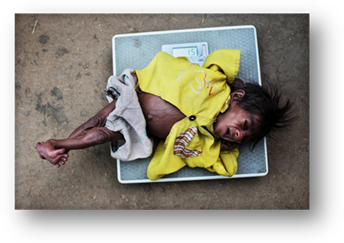 60% of their children under five underweight, 45% stunted and 30% wasted tells the story. Their language and consequently their culture are endangered too. Spandan has endeavored to address this pathos with a theory of change that strives on one hand to relieve the immediate nutritional emergency while on the other hand has directed its vigor at pro –poor democratically dictated Advocacy & Lobbying to assist nutritionally vulnerable Korku access more food and nutrition round the year as entitlement and not dole out. Spandan led by its founder members Seema and Prakash has been able to develop as a genuinely Mission driven and transparent grassroots organization that has stressed team work and democratic values to achieve its objectives. Spandan also addresses other Human Rights issues like Rights of Shelter less, Women Empowerment and Child Rights. Research, documentation and Media advocacy are ongoing activities of the organization. Seema and Prakash are ASHOKA Fellows based at Khandwa district of Madhya Pradesh (India). Spandan is engaged in proactive monitoring of nutritional status of the Korku families, empowering the Korku to keep a vigil on existing Public Food & Employment schemes, establishing micro models of community based malnutrition management for policy influencing, Advocate that Korku get the status and privileges of Primitive Tribal Groups and make efforts to preserve the endangered Korku language and culture. Spandan over the decade has been successful at raising many critical issues and draw government attention to various problems and injustice faces by the poor. Spandan spearheaded a Campaign against sub standard imported wheat that reached Ration shops in the state, alerted government on the alarming situation of malnutrition prevailing among the Korku tribe, revamped Anganwadis by drawing Administrative attention to sub standard nutritional supplements and brought to surface many cases of corruption and irregularities in Mahatma Gandhi National Rural Employment Guarantee Scheme. All this has gone to benefit the Korku community. At the grassroots Spandan has focused on addressing the malnutrition by establishing community based malnutrition management model that stress communitization of Health & Nutrition services. It in a way tries to establish the importance and viability of early identification, classification and home based care of Severe Acute Malnourished (SAM) children. 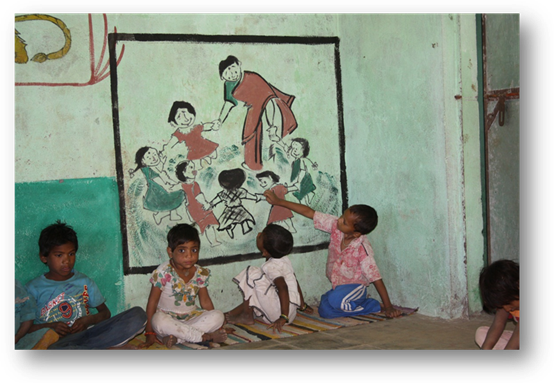 Anganwadis are converted into Child Friendly Centers by making the place a hub of creative activities. This has saved many children from reaching city based hospitals to go through a fortnight treatment protocol which most of the Korku mothers detest as it poses threat to other children back home and the fear of nosocomical infection increases. Spandan has facilitated evolution of MGNREGA wage earners’ collective that has proved its potential at representing their kinsmen, assisting food insecure families secure employment, facilitating quicker grievance redress and working towards preservation of Korku language and culture and advocating their inclusion in Primitive tribes’ category. Its approach is creative confrontation. To offset chronic hunger that peaks during certain months every year and escalates malnutrition and deaths, Spandan has promoted grain banks. The grain banks are formed among identified most food insecure families in the community including families with severely malnourished children, ones forced to distress seasonal migration, widowed and single women, landless families and ones aged and disabled. The community contributes as per its might and a portion goes as organization support. Community decides and manage lending and borrowing and expanding it. The initiative has proved to be a great succor in times of acute food shortage faced by the families. A proactive ethnographical research and documentation is underway to compile the history and aboriginal Korku culture to be handed to the younger generation so that they know their roots and rich cultural heritage being degraded due to rapid acculturation. 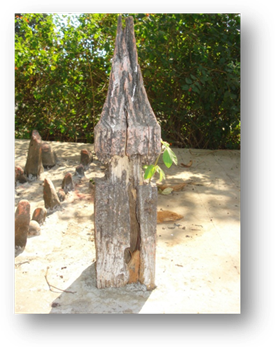 The efforts are also on to preserve the antiques and relics of their primordial life. Spandan in association with GOONJ has reinforced spirit of volunteerism and community assets building through Cloth for Work initiatives. The community relying on its own practical wisdom has developed their land and water assets, cleaned up the drainages, leveled the approach roads and constructed and deepened wells that all have gone to generate more livelihood options. The Tribal Entrepreneurship program has used materials support to generate capital to take up viable small economic activities in the local village markets. This initiative has infused greater confidence and self-respect among the tribal entrepreneurs and as a byproduct has sharpened their leadership qualities and showed potential for scaling up. The sanitary napkin has been adopted at large and the issue of reproductive health and hygiene is not a taboo subject in the Korku community. The clothing issue is addressed with dignity and fulfills a hitherto unrecognized and a great need of tribal community. Spandan is currently reaching out to nearly 30,000 U5 children and their families across 100 villages of Khalwa Block in Khandwa district in MP.